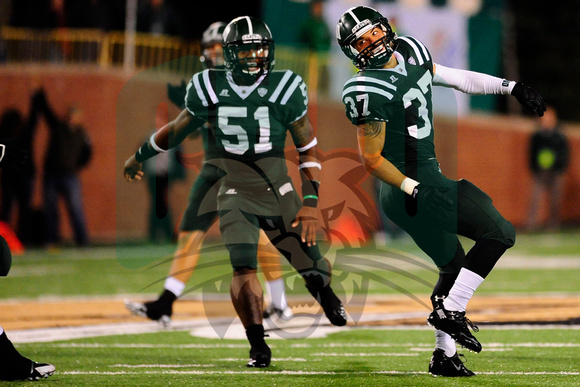 Most teams play better at home than on the road, but few teams saw a larger home/road split than the Ohio Bobcats. 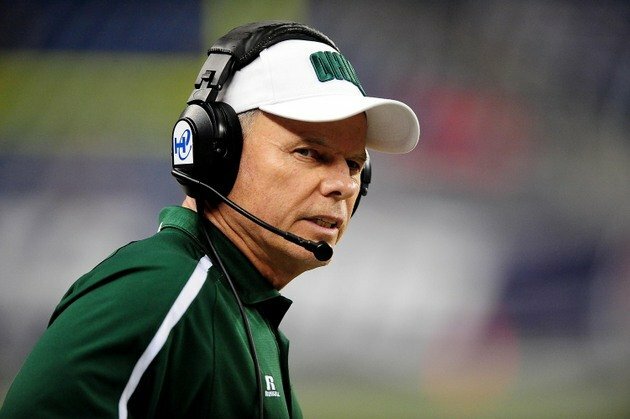 If Frank Solich’s squad can continue the home success and improve their performance in unfriendly confines then they well buck their three-year trend of declining win totals. Regardless of where they are playing, Ohio is going to need more out of their skill players than they got last year or they will have trouble beating anybody. That’s especially true at quarterback. QBs J.D. Sprague and Derrius Vick split time last season with neither being particularly effective. They combined to complete just over half of their passes, took twice as many sacks as threw TD passes and threw nine interceptions. Vick will likely get the starting nod, but if he can’t improve upon those numbers Ohio may turn elsewhere. 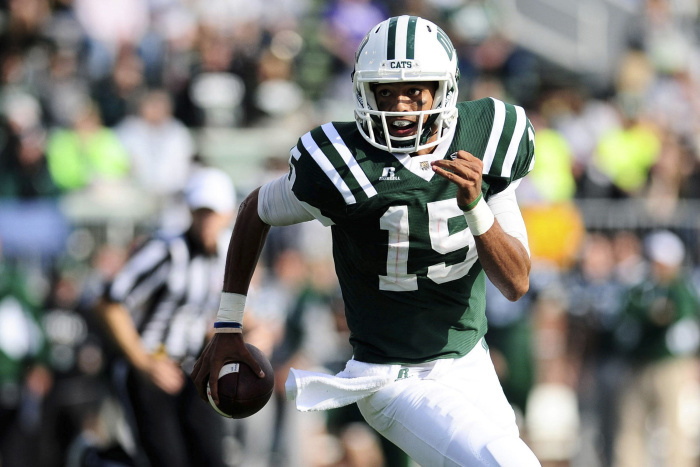 Running the ball was marginally more effective for the Bobcats, but not without flaw. Walk-on A.J. Ouellette emerged as the featured back mainly because Daz Patterson and Dorian Brown couldn’t hold on to the ball. Patterson and Brown combined to fumble the ball on nearly 10% of their carries. That’s horrid. It’s hard to say whether the receivers were bad because the quarterbacks were bad, or if they deserve an equal share of the blame. We should find out this year with Sebastian Smith and Jordan Reid returning, plus Troy Mangen at tight end. The biggest issue was that they provided virtually no deep threat. No receiver topped 500 yards last season for the Bobcats, and only one topped 400 and he’s gone. The good news is that there are two potential deep threats on campus now with true freshmen Elijah Ball and Kyle Belack. Anytime you return every single linebacker from a corps that was one of the best in the conference there is reason for optimism, and for this Bobcat defense the optimism is well placed. As long as the offense can keep them from having to spend all game on the field, they should be one of the better overall defenses in the conference. SLB Jovon Johnson and DE Tarell Basham are the headliners of the defense with both receiving ample preseason All-conference consideration. MLB Quentin Poling, who led the team in tackles last season and pitched in five sacks and three interceptions, returns in 2015 as long as a pair of experienced weakside linebackers in Blair Brown and Chad Moore. The defensive line probably played a little bit below its talent level last year, but it was still respectable and with ends Basham and Kurt Lasheak back it should improve. They combined to produce 9.5 tackles for loss and 7 sacks last year. The interior line is facing some turnover, but guys like Watson Tautuiaki and Brandon Purdum did get some playing time last year so they aren’t completely green. If the saying that you are only as strong as your weakest link is indeed true, then the fate of this defense is heavily reliant upon the play of the defensive backfield. Part of their issues last season can be attributable to injuries, which is good news for two reasons. First, injury luck generally regresses to the mean over time. Second, it means that a fair amount of young guys got more experience last year than they would have expected. CBs Devin Bass and Ian Wells missed substantial playing time and safety Nathan Carter missed the whole season. All three of those guys are back and healthy now, plus the guys who filled in in their absence also return. Most people probably think they will be a little better than this and if they continue the strong play at home in late season games against Kent State and Ball State then they will be. However, momentum is a big thing in college football, and the early season schedule is a slog with non-conference games against Marshall and at Minnesota, plus a road date with improved Akron. The roughest stretch of conference play is a home game against preseason MAC darling Western Michigan before back-to-back road games against Buffalo and Bowling Green. Ohio should beat Buffalo, but not necessarily if they are as bad on the road in 2015 as they were in 2014.